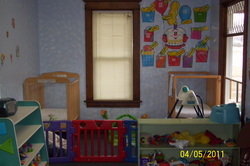 Our Infant Room is licensed for 8 babies. Ratio is one staff to four babies. We offer sign language to our babies as we prepare them to sign back to ease them through their day. The curriculum is set up on a monthly basis for each child, working on the skills needed for growth and development. We are on the state food program and offer two types of formula and commercial foods. Special request on the food can be accommodated also. Staff continue to do yearly training to bring the most current ideas back to the classroom. 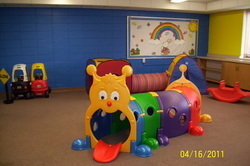 Our Toddler Rooms are licensed for 14 children. Ratio is one teacher to seven children. As the children grow through this room, they will discover the skills of communication as the language skills starts to form. Introductions to feelings and how to work along side their peers is a skill they work on also. A simple daily routine will be introduce as they learn the importance of structure. Re-directing is our means of discipline. They will explore shapes, colors, and feelings while playing with new friends. We introduce and guide potty training while working with the parents for success. 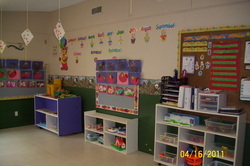 Our 3-4 Discovery Preschool is licensed for 20 children. Ratio is one teacher to ten children. Children are exploring and discovering their surroundings and limits. 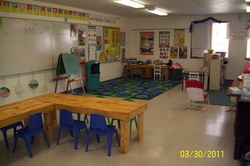 The classroom is set up with instruction and materials to grow. 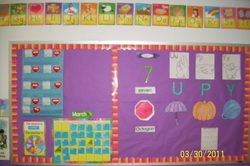 Letter and number recognition is introduced and pre-writing skills are explored. Children will learn how to parallel play as they work on problem solving and how to handle their feelings. Consequences, re-directing and modeling good behavior and making good choices are our means of discipline. 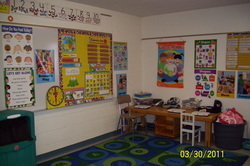 Our 4-5 Kindergarten Readiness Room is licensed for 18 children with a ratio of one teacher to ten students. Circle time, fine motor skills, science, math, letter recogonition and letter sounding are a few of the concepts we introduce. Teaching self help skills and having the childen take on these tasks will develop an independent, well-rounded student. Re-directing, teaching self control and consequences is our means of discipline. This is a year round program with a change of direction in the summer to accommodate out Kindergarten students. His Kids club is design for our students K-5th grade. During the school year we use teachers from the center to care for students before and after school. Teachers get students on the bus, and greet students when they get off the bus. Breakfast and snacks are provided, as well as homework help and a place for students to play and relax after school. During the summer, His Kids provides full day child care for school age children who have completed kindergarten up to 5th grade. Summer curriculum includes continue practice of skills students learned during the school year to keep them fresh and prepared for the next school year. Field trips are created to fit themed weeks that create an entertaining, interactive atmosphere, which includes art projects that foster creativity, science experiments, which challenges their thinking, and plenty of time to be active outdoors. 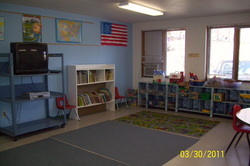 We have a new room for our children who are 16 montsh to 5 years of age. 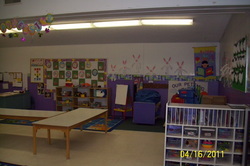 This large motor room will be used when we can not go outside and want to burn off some energy. 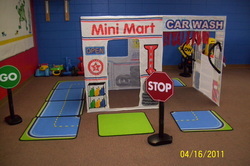 Children can drive through the Mini-Mart and gas up the riding toys. Children can climb through the crazy caterpillar, throw balls into the basketball hoop, jump on the mini trampoline and more! We are excited as this room will bring alot of fun for everyone. Just opened in April of 2011.